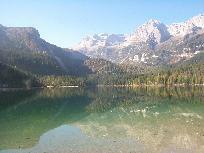 This is the largest park in Trentino. 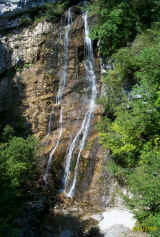 It is accessible from the Non Valley, the Sole Valley, the Rendena Valley, the Giudicarie Valley, Molveno and Andalo. It has a surface area of 61,864 hectares and its altitude varies between 477 metres at Acqua Santa (Spormaggiore) and 3,556 at the top of the Cima Presanella. About 80% of the territory belongs to the surrounding ASUC and Regole municipalities and the remaining 20% is the property of the Autonomous Province of Trento. The park’s territory is divided into four different types, depending on its ecological and environmental value. The park is dotted with 51 lakes, almost all of which are of glacial origin and the most famous of which is Lake Tóvel. 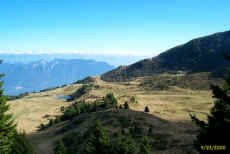 Most of the lakes are concentrated in the western sector of the park, in the Adamello-Presanella Group, where glaciers are more common. Interesting karst phenomena can be seen throughout the park – the largest caves are to be found in the southern sector of the Brenta between the Ambiez Valley and the Croz Altissimo peak. From the mineralogical point of view there is a clear distinction in the composition of the rocks in the western sector (Adamello-Presanella Group) and the eastern sector (Brenta Group). The former is characterised by granite rock of a siliceous nature which was formed some 50 million years ago by deep deposits of magma which, rising to the surface and hardening, gave rise to the mountain chain. The Brenta Group, on the other hand, is made of limestone rock with some calcium carbonate and magnesium (the latter element gives the rocks their pink-orange colouring at sunrise and sunset); this phenomenon was discovered by the French mineralogist Guy Tancrède de Dolomieu, in honour of whom the rock was called “dolomitic” and the mountain chains with similar characteristics were called the Dolomites. The origin of the Brenta Dolomites is due to two phenomena: the first was sedimentation which came about between 225 and 100 million years ago in a marine-lagoon environment, which led to the building up of calcareous materials with an enormous quantity of marine organisms and shells; the second process was tectogenesis between 100 and 70 million years ago which gave rise to a considerable folding action of the surface crust in the area, leading to the formation of the “Giudicarie line”. During the Tertiary period, about 30 million years ago, the basis of the Brenta began to emerge to the east of this fracture; the mountains we see today have been shaped and eroded over the intervening years by climatic conditions.